MOSCOW, April 23. /TASS/. The opposition rallies in Armenia are a domestic affair and any hypothetic deliberations on possible Russian meddling in this situation are irrelevant, Kremlin Spokesman Dmitry Peskov told reporters on Monday. "This is absolutely Armenia’s domestic affair, this is all I can say," Peskov said when asked if Russia saw a threat of destabilization in the region amid the protests in Armenia. "Why should Moscow interfere?" he said, noting that any hypothetic deliberations are absolutely irrelevant. Peskov declined to say if Yerevan requested consultations with the Kremlin in connection with the events in Armenia. Russian President Vladimir Putin earlier congratulated Armenian President Armen Sarkissian and Prime Minister Serzh Sargsyan on their election, Peskov noted. "We are carefully watching what is going on in Armenia. Armenia is our closest ally and we have been developing very close relations with it. Armenia is a member-state of the Eurasian Economic Union and therefore this country is important for us and we are carefully monitoring the events there," he said. Touching on a possible introduction of a special regime at the Russian military base in Gyumri, the Kremlin spokesman said this was a matter of the Russian Defense Ministry. 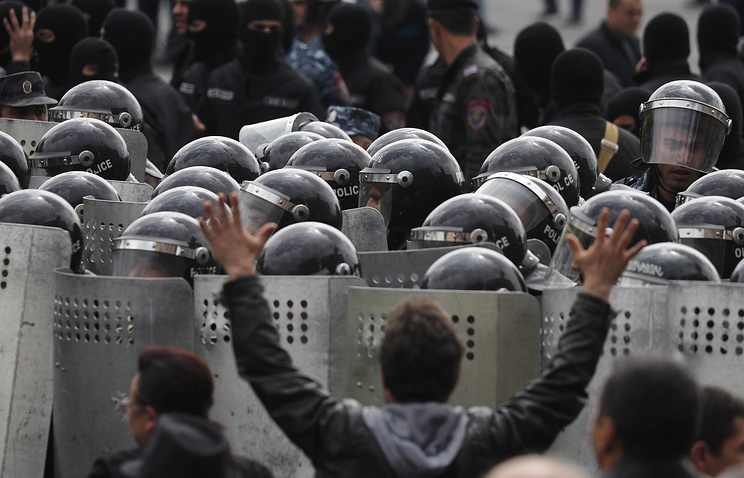 Mass rallies kicked off in Yerevan and other Armenian cities on April 16. The opposition demands that Serzh Sargsyan, who was elected as the prime minister by the parliament after 10 years of presidency, should step down. On April 22, Sargsyan walked out of talks with opposition leader Nikol Pashinyan. Armenia’s Prosecutor General’s Office confirmed the detention of Pashinyan and two other MPs, Ararat Mirzoyan and Sasun Mikayelyan, over the illegal rallies.